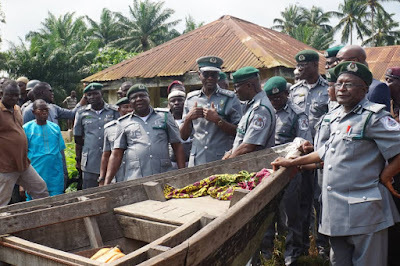 The Nigerian Customs Service (NCS) has sought for improved synergy among sister security agencies in the country towards ensuring that smuggling activities are brought to the minimal level. The NCS Assistant Controller General (ACG) in charge of Zone ‘A’, Aminu Dahiru, stated this while addressing officers and men of the command at the command’s office in Ojofin, Ipokia Local Government of Ogun state. The ACG, who is on duty tour of the Ogun Area Command of the service, insisted that the menace of smuggling requires a combined efforts to be decimated. Dahiru warned that the activities of smugglers portend great danger for the Nigerian state if not urgently checked. According to him, “Smuggling is a menace to the nation and it is our collective responsibility to fight it. It requires a lot of logistics, personnel, synergy and cooperation. “But the truth of the matter is that even if you have all it takes in the area of logistics, a single organisation cannot fight it. No matter how equipped you are. “In essence, we need each other to end it. More so, we have to operate in a hostile environment as this. We have to talk to local people and make them realise the dangers associated to smuggling”. “This is because a smuggler can bring in anything that is dangerous like arms and ammunition. From onset, the intention is not good because there are things that can’t be imported”. The customs boss also disclosed that smuggling activities has continued to have negative effect on the revenue generation of government. He however requested for renewed patriotism on the part of the officers and men of the command, especially those operating at the hinterlands. He said, “another is that it benefits individual and not the country. Duty paid on goods goes to the nation’s account but the money made from smuggling goes into the private account of the individual. “In a nutshell, we have to have that patriotism required by law in each and every one of us. We must come together to be on the side of the state. If we don't do that, we are as bad as the smugglers. “I choose this pace to visit because of its significant. One is because of the convergence of the sister security agencies here. It shows there's is peace and understand and that will assist us to fight any war, be it physical or psychological”. “Never look down on your colleague. There's no agency that is not important. We should do our work collectively and intelligently.